Talk of a fascist politics emerging in the United States is often criticized as either a naive exaggeration or a failure to acknowledge the strength of liberal institutions. Yet, the case can be made that rather than harbor an element of truth, such criticism further normalizes the very fascism it critiques, allowing the extraordinary and implausible to become ordinary. After decades of the neoliberal nightmare both in the United States and abroad, the mobilizing passions of fascism have been unleashed unlike anything we have seen since the 1930s. The architects and managers of extreme capitalism have used the crisis of economic inequality and its “manifestly brutal and exploitative arrangements” to sow social divisions and resurrect the discourse of racial cleansing and white supremacy. In doing so, they have tapped into the growing collective suffering and anxieties of millions of Americans in order to redirect their anger and despair through a culture of fear and discourse of dehumanization; they have also turned critical ideas to ashes by disseminating a toxic mix of racialized categories, ignorance, and a militarized spirit of white nationalism. While there is no perfect fit between Trump and the fascist societies of Mussolini, Hitler, and Pinochet, “the basic tenets of extreme nationalism, racism, misogyny, and a hatred of democracy and the rule of law” are too similar to ignore. The deep grammar of violence now shapes all aspects of cultural production and becomes visceral in its ongoing generation of domestic terrorism, mass shootings, the mass incarceration of people of colour, and the war on undocumented immigrants. Not only has it become more gratuitous, random, and in some cases trivialised through the monotony of repetition, it has also become the official doctrine of the Trump administration in shaping its domestic and security policies. Trump’s violence has become both promiscuous in its reach and emboldening in its nod to right-wing extremist groups. The mix of white nationalism and expansion of policies that benefit the rich, big corporations and the financial elite are increasingly legitimated and normalised in a new political formation that I have termed neoliberal fascism. I am not suggesting that all conservative politicians, including right-wing elements of the Democratic Party such as the Clinton/Obama wing, support the same reactionary policies embraced by Trump and his followers. In fact, Democratic Party politicians from Hillary Clinton and Obama to Feinstein and Pelosi actually profess to be a counter force to Trump—often labelling themselves as the party of resistance—but in the long run, they end up supporting neoliberal policies and power relations that favour the ruling elites. If one is willing to throw some light on the historical amnesia that the current crop of democratic presidential hopefuls appear to embrace, it becomes clear that previous Democratic Party policies under Clinton and Obama paved the way for Trump. Clinton signed a draconian crime bill in 1994. The bill slavishly indulged the then “national frenzy” for law and order as a form of punishment and enacted policies such as “three strikes,” “truth in sentencing,” and “mandatory minimums.” The bill was also responsible for implementing tsunami of mass incarceration that destroyed lives, families, and mostly black communities. At the same time, Clinton signed on to NAFTA, and deregulated the financial industry. The class and racist thread that connects these two bills is shamefully obvious. Fast forward to the Obama presidency. Rather than challenge the utopian greed of a savage capitalism, Obama turned hope for the many into hope for the bankers and financial elite and hopelessness for millions of Americans who had lost their homes during the 2008 economic recession. Rather than bailing out people who suddenly found themselves in massive debt and prosecuting the financial elite who caused the economic crisis, Obama bailed out the bankers who rewarded themselves with big bonuses and even bigger profits. He also sold billions of dollars of military arms to Saudi Arabia. As Mike Davis and Daniel Monk once put it, “the Champaign days of the Great Gatsby have returned with a vengeance” and we cannot put the entire blame on Trump and his Vichy Republican Party gravediggers. Unfortunately, the political proponents of fanatical capitalism are still with us in the likes of a number of Democratic Party presidential candidates that extend from Joe Biden who “once opposed busing to desegregate his state’s public schools” to Beto O’Rourke who refused to even label himself as a progressive. There is no talk among these candidates for addressing massive financial and social inequality, redistributing wealth to the working and middle classes, or dismantling the power of the criminogenic financial and cultural institutions modelled after Goldman Sachs. Under such circumstances, these alleged “liberal” politicians, not unlike the German-Socialist in the Weimer Republic, turned their back on the needs of workers, the poor, minorities of class and color, and in doing so helped to create a populist revolt that supported the anti-elitist, anti-government discourse on which Trump ran his presidential campaign. It is worth noting that I am not arguing that neoliberalism is intrinsically fascist as much as I am insisting that it created the conditions, particularly in the wake of the Trump regime, for an updated form of fascist politics in the United States. The urgency of addressing the rise of fascism both in the United States and abroad might begin with the regime of untruth and manufactured illiteracy that allows and normalizes the catastrophic conditions that make neoliberal fascism a potent source of identity, fantasy, and pleasure. One place to start would be a critical analysis of the Trump administration’s efforts to abandon and discredit traditional sources of evidence, facts, and analysis in its attempt to normalize fake news, a culture of lying, and the world of alternative facts. At issue here is making visible a radical new relationship between the public and truth and the ensuing demise of civic culture and the public institutions that make it possible. As the public’s grip on civic literacy weakens, language is emptied of any substantive meaning and the shared standards necessary for developing informed judgements and sustained convictions are undermined. In a world where nothing is true, all that is left to choose from are competing fictions. One consequence is that everything begins to look like a lie. As the historian, Timothy Snyder points out “To abandon facts is to abandon freedom. If nothing is true, then no one can criticize power, because there is no basis upon which to do so. If nothing is true, then all is spectacle.” More startling is the assumption that what matters in an age of deep divisions, exploitation, and precarity is not whether something is true or false but the promise of a consistent narrative in which people can recognize themselves while willing to “abolish their capacity for distinguishing between the truth and falsehood, between reality and fiction.” Of course, there is more at stake here than the creation and normalization of a culture of lying and what Walter Benjamin, Guy Debord and others identified as the theatricalization of politics, there is also the threat to democracy itself. We do not live in a post-truth world and never have. On the contrary, we live in a pre-truth world where the truth has yet to arrive. As one of the primary currencies of politics, lies have a long history in the United States. For instance, state sponsored lies played a crucial ideological role in pushing the U.S. into wars in Vietnam, Iraq, and Afghanistan, legitimated the use of Torture under the Bush administration, and covered up the crimes of the financial elite in producing the economic crisis of 2008. Moreover, we have been living the lie of neoliberalism and white nationalism for over forty years and because of the refusal to face up to that lie, the United States has slipped into the abyss of an updated American version of fascism of which Trump is a both symptom and endpoint. Under Trump, lying has become a rhetorical gimmick in which everything that matters politically is denied, reason loses its power for informed judgments, and language serves to infantilize and depoliticize, as it offers no room for individuals to translate private troubles into broader systemic considerations. Truth is now mobile making it easier to deny even a modicum of rational judgment while reinventing a fascist politics that echoes the past and allows the “intrusion of criminality into politics.” Post-truth is a pedagogical tool of deflection that as the novelist Toni Morrison points out functions “like a coma on the population” imposing misery and traumas so deep and cruel that they kill the moral imagination and “purge democracy of all of its ideals. This period of civic and political decline has been termed by many theorists and pundits as the era of post-truth. While questions about truth have always been problematic among politicians and the wider public, both groups, however disingenuous, gave lip service to the assumption that the search for truth and respect for its diverse methods of validation were based on the shared belief that “truth is distinct from falsehood; and that, in the end, we can tell the difference and that difference matters.” It certainly appeared to matter in a democracy, particularly when it became imperative to be able to distinguish, however difficult, between facts and fiction, reliable knowledge and falsehoods, and good and evil. Under the Trump administration that principle however no longer appears to be the case, especially as chronic right-wing lying has taken over the white house. As the politics of lying moves from the margins to the center of power, Trump’s fake news industry wields enormous political and pedagogical power while at the same time accelerating and normalizing and endless stream of fake news and misrepresentations, wrapped in a kind of dystopian legitimacy. Trump’s attack on the truth wages a war against the ethical imagination, privatizes experiences, and resonates with a larger culture of speed, instant gratification, and consumerism. Coupled with a society that worships celebrity culture, the power of spectacle and the masculinization of the public sphere make it easier for Trump and his associates to rehabilitate fascist ideas, principles, and a fascist political culture. In the current historical moment, the boundaries between truth and fiction are disappearing, giving way to a culture of immediacy, consumerism, and falsehoods. Under such circumstances, civic culture withers and politics collapses into the personal and irrational. At the same time, pleasure is harnessed to a culture of corruption and cruelty, language operates in the service of violence, and the boundaries of the unthinkable become normalized. How else to explain President Trump’s strategy of separating babies and young children from their undocumented immigrant parents in order to incarcerate them in Texas in what some reporters have called cages. Trump’s misleading rhetoric is used not only to cover up the brutality of oppressive political and economic policies, but also to resurrect elements of a fascist politics that have emerged in an unceasing stream of hate, bigotry and militarism. Trump’s indifference to the boundaries between truth and falsehoods reflects not only a deep-seated anti-intellectualism, lawlessness, and unchecked paranoia, it also points to his willingness to judge any appeal to the truth as inseparable from an unquestioned individual and group loyalty on the part of his followers. As self-defined sole bearer of truth, Trump disdains reasoned judgment and evidence, relying instead on instinct and emotional frankness (his gut) to determine what is right or wrong and who can be considered a friend or enemy. In this instance, truth becomes a performance strategy designed to test his followers’ loyalty and willingness to believe whatever he says. Truth now, in part, becomes synonymous with a regressive tribalism that rejects shared norms and standards while promoting a culture of corruption and what former New York City mayor Michael Bloomberg called an “epidemic of dishonesty.” Truth is now part of a web of relations and worldview that draws its elements from a fascist politics that can be found in all the commanding political institutions and media landscapes. Truth is no longer merely fragile or problematic; it has become toxic and dysfunctional in a media ecosystem largely controlled by militant conservatives and a financial elite who invest heavily in right-wing media apparatuses such Fox News and white nationalist social media platforms such as Breitbart News. At a time of growing fascist movements across the globe, power, culture, politics, finance, and everyday life now merge in ways that are unprecedented and pose a threat to democracies all over the world. As cultural apparatuses are concentrated in the hands of the ultra-rich and major tech companies, the educative force of culture has taken on a powerful anti-democratic turn. This can be seen in the rise of new digitally driven systems of production and consumption that produce, shape, and sustain ideas, desires, and social relations that contribute to the disintegration of democratic social bonds and promote a form of social Darwinism in which misfortune is seen as a weakness and the Hobbesian rule of a ‘war of all against all’ replaces any vestige of shared responsibility and compassion for others. The era of post-truth is in reality a period of crisis which as Gramsci observed “consists precisely in the fact that the old is dying and the new cannot be born [and that] in this interregnum a great variety of morbid symptoms appear.” Those morbid symptoms are evident in Trump’s mainstreaming of a fascist politics in which there is an attempt to normalize the language of racial purification, the politics of disposability and social sorting while hyping a culture of fear and a militarism reminiscent of past and current dictatorships. Trump’s lying is the mask of nihilism that reinforces the ideological architecture of neoliberal fascism. Under such circumstances, the state is remade on the model of finance, all social relations are valued according to economic calculations, and the dual project of ultra-nationalism and right-wing apocalyptic populism merge in an embrace of a toxic and unapologetic defense of white supremacy. Unsurprisingly, Trump views language as a weapon of war, and social media as an emotional minefield that gives him the power to criminalize the political opposition, malign immigrants as less then human, and revel in his role as a national mouthpiece for white nationalists, nativists, and other extremist groups. Unconcerned about the power of words to inflame, humiliate, and embolden some of his followers to violence, he embraces a sadistic desire to relegate his critics, enemies, and those considered outside of the boundaries of a white public sphere to zones of terminal exclusion. In this instance, truth when aligned with the search for justice becomes an object of disdain, if not pure contempt. The entrepreneurs of hate are no longer confined to the dustbin of history, particularly the proto fascist era of 1930s and 1940s. They are with us once again producing dystopian fantasies out of the decaying communities and landscapes produced by forty years of a savage capitalism. White male rage has emerged out of the destruction of social bonds and the gutting of the welfare state and intensified with the neoliberal unleashing of destructive energies of “deracination, displacement, and disintegration.” Angry white male loners looking for a cause, a place to put their agency into play, are fodder for cult leaders. They have found one in Trump for whom the relationship between the language of fascism and its toxic worldview of “blood and soil” and the “fear of inferior blood” has moved to the center of power in the United States. While campaigning for the mid-term 2018 elections, President Trump reached deep into the abyss of fascist politics and displayed a degree of racism, hatred, and ignorance that sent alarm bells ringing across the globe. Blind to public criticism, Trump has refused to acknowledge how his rhetoric, rallies, and interviews fan the flames of racism and anti-Semitism. Instead, he blames the media for the violence he encourages among his followers, calls his political rivals enemies of the American people, labels immigrants as invaders, and publicly claims he is a nationalist emboldening right-wing extremist groups. Incapable of both empathy and self-reflection, he can only use language in the service of vilification, insults, and violence. Trump is the necessary outcome of a neoliberal culture of hyper-punitiveness amplified through an ascendant fascist politics that enshrines militarization, privatization, deregulation, manic consumerism, the criminalization of entire groups of people, and the financialization of everything. Fascism first begins with language and then gains momentum as an organizing force for shaping a culture that legitimates indiscriminate violence against entire groups — Black people, immigrants, Jews, Muslims and others considered “disposable.” In this vein, Trump portrays his critics as “villains,” describes immigrants as “losers” and “criminals,” and has become a national mouthpiece for violent nationalists and a myriad of extremists who trade in hate and violence. Using a rhetoric of revulsion as a performance strategy and media show to whip up his base, Trump employs endless rhetorical tropes of bigotry and demonization that set the tone for real violence. Trump appears utterly unconcerned by the accusation that his highly charged rhetoric of racial hatred, xenophobia and virulent nationalism both legitimates and fuels acts of violence. He proceeds without concern about the consequences of either his deprecating discourse or lending his voice to conspiracy theorists claiming that George Soros is funding the caravan of migrant workers, calling CNN anchor Don Lemon “the dumbest man on television,” or referring to the basketball star, LeBron James as not being very smart. While Trump insults a variety of public figures, his attacks on African-Americans follows the standard racist stereotype of calling into question their intelligence. Meanwhile, this inflammatory invective offers a platform for inducing violence from the numerous fascist groups that support him. Trump thrives on promoting social divisions that amplify friend/enemy distinctions, and he often legitimates acts of violence and expressions of radical extremism as a means of addressing them. Trump has repeatedly embraced rhetorical divides between law-abiding citizens and criminal elements, between us and them, and hardworking versus lazy. Drawing from the fascist playbook, he portrays whites as victims and privileged members of a chosen nation. For instance, he has cast immigrants at the Southern border as terrorists and infamously stated, without irony, that the neo-Nazi protesters in Charlottesville were “very fine people.” He declared in 2016 “I think Islam hates us,” lied about seeing Muslims celebrate the September 11 attacks, and refers to immigrants on the southern border as invaders and in doing so uses the language of white nationalists and White supremacists. Moreover, he has stated without shame that he is a nationalist. For example, in one of his rallies, he urged his base to use the word nationalism stating, “You know…we’re not supposed to use that word. You know what I am? I am a nationalist, Okay? I am a nationalist. Nationalist. Nothing wrong. Use that word. Use that word.” Not only does Trump’s embrace of the term stoke racial fears, it ingratiates him with elements of the hard right, particularly white nationalists. After Trump’s strong appropriation of the term at an October 2018 rally, Steve Bannon in an interview with Josh Robin indicated, “he was very very pleased Trump used the word ‘nationalist.’” Trump has drawn praise from a number of white supremacists including David Duke, the former head of the Ku Klux Klan, the Proud Boys–a vile contemporary version of the Nazi Brown Shirts-and more recently by the alleged New Zealand shooter who in his Christchurch manifesto praised Trump as “a symbol of renewed white identity and common purpose.” Trump’s use of the term is neither innocent nor a clueless faux pas. In the face of a wave of anti-immigration movements across the globe, it has become code for a thinly veiled racism and signifier for racial hatred. In the alleged era of post-truth, actions are removed from any notion of social responsibility, and truth is detached from the search for justice. One consequence is the growing influence of a neo-fascist-type spectacle modeled after the emptiness and cheap pleasures of game shows, reality TV, and celebrity culture. All of which provide further opportunities for Trump to harness the public’s “free-floating anger, despair and apathy” into a celebration of militarism, hyper-masculinity, and spectacularized violence that mark his “frenzied Nuremberg-style rallies,” which serve largely as a cauldron of race baiting and anti-Semitic demagoguery. There are historical precedents for this collapse of language into a form of coded militarism and racism — the anti-Semitism couched in critiques of globalization and the call for racial and social cleansing aligned with the discourse of borders and walls. Echoes of history resonate in this assault on minority groups, the use of racist taunts, and twisted references that code a belief in racial purity, and legitimate attacks on and possible criminal action against those who do not mirror the twisted notions of white supremacy. In an age when civic literacy and efforts to hold the powerful accountable for their actions are dismissed as “fake news,” ignorance becomes the breeding ground not just for hate, but for a culture that represses historical memory, shreds any understanding of the importance of shared values, refuses to make tolerance a non-negotiable element of civic dialogue and allows the powerful to weaponize everyday discourse. While Trump has been portrayed as a serial liar, it would be a mistake to view this pathology as a matter of character. Lying for Trump is a tool of power used to discredit any attempt to hold him accountable for his actions while destroying those public spheres and institutional foundations necessary for the possibility of a democratic politics. At the heart of Trump’s world of lies, fake news, and alternative facts is a political regime that trades in corruption, the accumulation of capital, and promotes lawlessness, all of which provides the foundation for a neoliberalism on steroids that now merges with an unabashed celebration of white nationalism. The post-truth era constitutes both a crisis of politics and a crisis of history, memory, agency, and education. It is worth reiterating that, this new era of barbarism cannot be understood or addressed without a reminder that fascism has once again crystalized into new forms and has become a model for the present and future. Trump’s language and policies are best understood as a contemporary remnant of the fascist imagination. Fantasies of absolute control, racial cleansing, unchecked militarism, and class warfare are at the heart of an American imagination that has turned lethal. This is a dystopian imagination marked by hollow words, an imagination pillaged of any substantive meaning, cleansed of compassion, and used to legitimate the notion that alternative worlds are impossible to entertain. What we are witnessing is a shrinking of the political and moral horizons and a full-scale attack on justice, thoughtful reasoning, and collective resistance. Trump’s aversion to the truth resembles Orwell’s Ministry of Truth in that it provides a bullhorn for violence against marginalized groups, journalists, and undocumented immigrants, all the while disseminating its lies through a massive disimagination tweet machine. This dystopian propaganda apparatus is also fueled by a language of silence and moral irresponsibility couched in a willingness on the part of politicians and the public to look away in the face of violence and human suffering. This is the worldview of fascist politics and a dangerous nihilism — one that reinforces a contempt for human rights in the name of financial expediency and the cynical pursuit of political power. Under the current reign of neoliberal fascism, politics extends beyond the attack on any vestige of truth, informed judgments, and constructive means of communication. There is more at work here than the need to decode and analyze Trump’s language as a tool for misrepresenting reality and shielding corrupt practices and policies that benefit major corporations, the military, and the ultra-rich. There is also a worldview, a mode of hegemony, which comes out of a fascist playbook, and translates into dangerous policies and potentially violent acts. This is evident in Trump’s attacks on dissent and his support for the use of violence against journalists and politicians who are critical of his views. One such example can be found in his critique of members of the Democratic Party whom he labeled as the radical left. Not only did he hurl a McCarthyite slur at them, he also implied in one instance that one response to their opposition might be violence. His comments speak for themselves.. He stated “O.K.? I can tell you I have the support of the police, the support of the military, the support of the Bikers for Trump. I have the tough people but they don’t play it tough until they go to a certain point, and then it would be very bad, very bad.” There is more at work here than infantilizing schoolyard threats. We have seen too many instances where Trump’s followers have beaten critics, attacked journalists, and shouted down any form of critique aimed at Trump’s policies — to say nothing of the army of trolls unleashed on intellectuals and journalist critical of the administration. A few weeks prior to the 2018 midterm elections, a number of Trump’s outspoken critics, all of whom have been belittled and verbally attacked by Trump, were sent homemade pipe bombs in the mail. Cesar Sayoc — the man who was charged in connection with the bombings — is a strong Trump fan whose Twitter feed is littered with right-wing conspiracy theories along with an assortment of “apocalyptic, right-wing dystopian fantasies.” Trump’s fans include a number of white nationalist and white supremacists who have been involved in recent killings in both Pittsburgh and New Zealand. 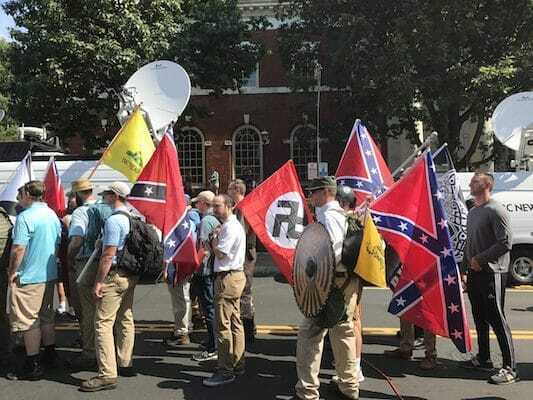 Trump does not just fan the flames of violence with his rhetoric; he also provides legitimation to a number of white nationalist and right wing extremists groups who are emboldened by his words and actions. These groups too often are ready to translate their hatred into the desecration of synagogues, schools, and other public sites as well as engage in violence against peaceful protesters, and in some cases commit heinous acts of violence. Without a care as to how his own vicious and aggressive rhetoric has legitimated and galvanized acts of violence by an assortment of members of the “alt-right,” neo-Nazis and white supremacists, Trump refuses to acknowledge the growing threat of white nationalism and supremacy, even as he enables it with his discourse of walls, alleged invading hordes, and celebration of nativism. Trump remains silent about the fringe groups he has incited with his vicious attacks on the press, the judiciary and his political opponents. That is, he refuses to criticize them while shoring up their support my claiming he is a nationalist and surrounding himself with people like Stephen Miller who leaves little to the imagination regarding his white supremacist credentials. Trump told reporters after the Christchurch massacre that white nationalism both in the United States and across the globe was not a serious problem. In this instance, he appears clueless and incapable of empathy regarding the suffering of others, all while accelerating neoliberal and racist policies that inflict massive suffering and misery on millions. Violent fantasies are Trump’s trademark, whether expressed in his support for ruthless dictators or in his urging his followers at his rallies to “knock the crap out of” protesters. We have seen this celebration of violence in the past with its infantile appeal to a hyper-masculinity and its willingness to engage further in genocidal acts. Trump is the consequence of a malady that has been growing for decades. What is different about Trump is that he basks in his role and is unapologetic about enacting policies that further enable the looting of the country by the ultra-rich (including him) and by mega-corporations. He embodies with unchecked bravado the sorts of sadistic impulses that could condemn generations of children to a future of misery and in some cases state terrorism. He loves people who believe that politics is undermined by anyone who has a conscience, and he promotes and thrives in a culture of violence and cruelty. Trump is not refiguring the character of democracy, he is destroying it, and in doing so, resurrecting all the elements of a fascist politics that many people thought would never re-emerge again after the horrors and death inflicted on millions by previous fascist dictators. Trump represents an emergence of the ghost of the past and we should be terrified of what is happening both in the United States and in other countries such as Brazil, Poland, Turkey, and Hungary. Trump’s ultra-nationalism, racism, policies aimed at social cleansing, his love affair with some of the world’s most heinous dictators, and his hatred of democracy echoes a period in history when the unimaginable became possible, when genocide was the endpoint of dehumanizing others, and the mix of nativist and nationalist rhetoric ended in the horrors of the camp. The world is at war once again, it is a war against democracy, and Trump is at the forefront of it. Trump represents a distinctive and dangerous form of American-bred authoritarianism, but at the same time, he is the outcome of a past that needs to be remembered, analyzed, and engaged for the lessons it can teach us about the present. Not only has Trump “normalized the unspeakable” and in some cases the unthinkable, he has also forced us to ask questions we have never asked before about capitalism, power, politics, and, yes, courage itself. In part, this means recovering a language for politics, civic life, the public good, citizenship, and justice that has real substance. One challenge is to confront the horrors of capitalism and its transformation into a form of fascism under Trump. There will be no real movement for change without, as David Harvey has pointed out, “a strong anti-capitalist movement,” At the same time, no movement will succeed without addressing the need for a revolution in consciousness, one that makes education central to politics. As Fred Jameson has suggested such a revolution cannot take place by limiting our choices to a fixation on the “impossible present.” Nor can it take place by limiting ourselves to a language of critique and a narrow focus on individual issues. What is needed is also a language of militant possibility and a comprehensive politics that draws from history, rethinks the meaning of politics, and imagines a future that does not imitate the present. We need what Gregory Leffel calls a language of “imagined futures,” one that “can snap us out of present-day socio-political malaise so that we can envision alternatives, build the institutions we need to get there and inspire heroic commitment.” Such a language has to create political formations capable of understanding neoliberal fascism as a totality, a single integrated system whose shared roots extend from class and racial injustices under financial capitalism to ecological problems and the increasing expansion of the carceral state and the military-industrial-academic complex. Nancy Fraser is right in arguing that we need a subjective response capable of connecting diverse racial, social and economic crises and in doing so addressing the objective structural forces that underpin them. William Faulkner once remarked that we live with the ghosts of the past or to be more precise: “The past is never dead. It’s not even past.” Such a task is all the more urgent given that Trump is living proof that we are not only living with the ghosts of a dark past, which can return. Nevertheless, it is also true that the ghosts of history can be critically engaged and transformed into a radical democratic politics for the future. The Nazi regime was more than a frozen moment in history. It is a warning from the past and a window into the growing threat Trumpism poses to democracy. The ghosts of fascism should terrify us, but most importantly, they should educate us and imbue us with a spirit of civic justice and collective action in the fight for a substantive and inclusive democracy. Paul Gilroy, Against Race (Cambridge: Harvard University Press, 2000), 139. Mike Davis and Daniel Bertrand Monk, “Introduction”, in Mike Davis and Daniel Bertrand Monk, eds. Evil Paradises (NY: The New Press, 2007), p. xii. I want to thank Michael Lerner for helping me clarify this point. Toni Morrison, The Source of Self-Regard: Selected essays, Speeches, and Meditations (New York: Knopf, 2019), p.vii. See Sophia Rosenfeld, Democracy and Truth: A Short History (Philadelphia: University of Pennsylvania Press, 2019). Antonio Gramsci, Prison Notebooks, Ed. & Trans. Quintin Hoare & Geoffrey Nowell Smith, (New York: International Publishers, 1971), p.275-76. I take up the issue of neoliberal fascism in Henry A. Giroux, The Terror of the Unforeseen (Los Angeles: Los Angeles Review of Books, 2019). See Henry A. Giroux, American Nightmare: Facing the Challenge of Fascism (San Francisco: City Lights Books, 2018). Naomi Klein, No Is Not Enough (Canada: Random House, 2017), p. 55. Michael Lerner, Revolutionary Love: A Political Manifesto to Heal and Transform the World (Berkeley: University of California Press, 2019). For an analysis of the origins of fascism in American capitalism, see Michael Joseph Roberto, The Coming of the American Behemoth (New York: Monthly Review Press, 2019).